More Than a Word offers a fascinating look inside the growing movement to change the name of the Washington R*dskins football team. Directed by brothers John and Kenn Little, who are members of the Standing Rock Sioux tribe, the film traces how the word “r*dskin” evolved from being a term of racist derision and slander to being embraced as the name of one of the NFL’s most beloved franchises. It also draws on the voices of Native American activists and scholars to place this controversy within the wider context of Native American history and racial stereotyping more generally. More Than a Word is an ideal classroom resource for clarifying what’s truly at stake in contemporary debates about cultural appropriation and Native American-themed mascots. Our screening campaign will bring the film to college campuses, community centers, national conferences, tribes, and grassroots organizations across the country this fall and spring. See if a screening is scheduled in your area using the map below. If not, you can sign up to host a screening yourself! Brothers John Little and Kenn Little are originally from Denver, CO and are members of the Standing Rock Sioux tribe in North Dakota. John Little is currently a PhD student at the University of Minnesota. He recently completed his Master's Degree in History at The University of South Dakota and is currently pursuing his Educational Doctorate. His thesis was on the Lakota and the Vietnam War. His goals are to write Indigenous people into the historical narrative and help Native students into higher education. His main focus is on Native American veterans, music, cultural appropriation, and mascots. Kenn Little is a graphic designer and filmmaker currently residing in Kansas City, MO. He has a Bachelor's Degree in Graphic Design and New Media through Full Sail University. He has experience in print design, typography, digital design, music and video. He has filmed and edited several music videos and short films. The issue surrounding the use of Native American themed sports names and mascots has gained much momentum and media attention within the last few years, especially following the United States Patent and Trademark Office’s decision to revoke the registrations of six trademarks held by the Washington R*dskins football team. As this surge in attention has thrust the issue into the national spotlight, it has created much division in public opinion. Much of this polarization is not only the result of the difference in opinion itself but also by the media coverage that has fueled those opinions. Various organizations, for and against changing the name, have each utilized social media and news outlets to tell their side of the argument, but there has yet to be a definitive and objective source of information on the issue. More Than a Word will explore and explain that the issue is about much more than a sports team’s name. For many Native Americans as well as supporters of the name, it is about identity. For many Native Americans it is about protecting an identity that they have watched nearly vanish along with the lands they once inhabited. For fans of the team, it is about protecting the tradition of a team many have identified with since childhood. But who does Native American imagery belong to? Does it belong solely to Native Americans who have inhabited this continent since before America? Or does it belong to all citizens of America, a country founded on the appropriation of many cultures and races? Does a decision like the Trademark Office’s violate the freedoms of those Americans? The most common defense used in support of the name is that it is intended to honor the proud heritage of Native American people, but this defense often seems juxtaposed with images of drunken fans in war paint and chicken feather war bonnets. These stereotypical images seem to have been pulled directly from old films and cartoons that have now been labelled politically incorrect, but has the damage already been done? Have decades of stereotypes conditioned society to think differently of Native Americans? Have these stereotypes conditioned Native Americans to think differently of themselves? These are the questions that the film seeks to raise and address. As half Native American ourselves, enrolled in the Standing Rock Sioux Tribe in North Dakota, we have been exposed to the issue for most of our lives. For many Americans, however, the decision by the United States Patent Office was their first introduction to the fact that some Native Americans even took issue with the name. Many believe it to be a new issue that suddenly arose out of nowhere, but we know that the issue has been going on since the late 1960s. Being half Native American and half Caucasian has placed us in an interesting perspective. We have always felt as though we lived simultaneously in two very different worlds and that has allowed us to see and hear opinions on the issue that one might not hear otherwise. It is these opinions, collected from both sides, which have led us to believe that it is extremely important to have a definitive, unbiased source of information on the issue. We feel that, as Native Americans ourselves, we have been able to build trust and reach places that non-Native filmmakers may not be able to. We also feel that because we do not look overtly Native American, we have an advantage of being less threatening to non-Native supporters of the name who may otherwise feel intimidated speaking with Native Americans on an issue like this. With the recent surge in attention and continuing shift in public opinion, we feel that is only inevitable that the name will most likely be changed, but it is the effects of that change that could have the most impact. The film will also examine recent cases of high schools that once held the Redskins name and changed it. These cases could give a possible precursor to the effects of such a change. In many of those case, the results were both positive and negative, with Native Americans reclaiming aspects of their identity but also having more animosity directed towards them by those who sought to keep the name. It is our intent that through an unbiased and thorough examination of the issue, people can come to an educated understanding of the issue that still exhibits respect for Native Americans regardless of how they feel about the use of the name. 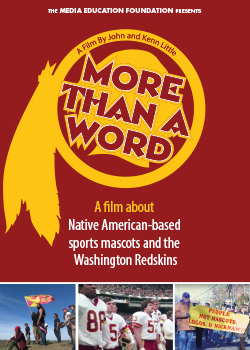 "More Than a Word delivers a compelling close-up of critiques and celebrations of the Washington Redskins and other indigenous-inspired mainstream representations. Through the creation of this urgent film and its eclectic array of personal interviews and archival media footage, Standing Rock Sioux filmmakers and brothers John Little and Kenn Little travel across Indian Country to listen to Native activists, artists, and scholars who represent indigenous self-determination in action and whose voices reveal that "Redskins" is far more than just a seven-letter word." "An artistic, political, culturally relevant project from an indigenous perspective. In its final act, More Than a Word winds up — for my money — in one of the most important places we can find, and that’s to say: what’s next for indigenous people? What would happen if they took control over their own representations?" "More Than a Word highlights why it is essential to take action and eliminate racial epithets and images. A documentary that can facilitate discussion and address the harmful effects of mascots as well as social responsibility." "This is an excellent, even-handed treatment of a long-standing dispute. Filmmakers John and Kenn Little, enrolled members of the Standing Rock Sioux Tribe, deliver it with authenticity. Highly recommended."